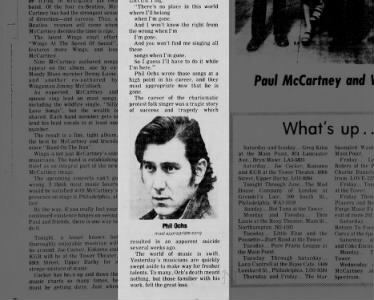 Phill Ochs, Los Angeles Ca, 1969. 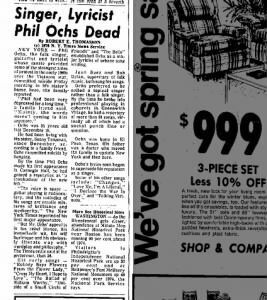 On April 9, 1976, Phil Ochs hanged himself. 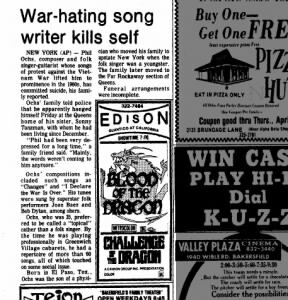 The world lost one of her best songwriters. 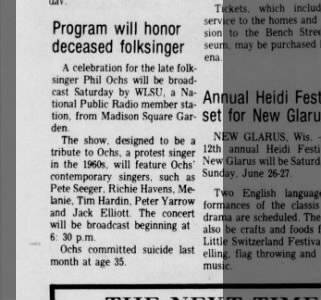 What follows below are but a few of the articles written immediately after his death. 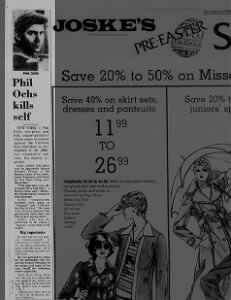 It’s truly a tragedy that it took his death for America to realize what a treasure she had in Phil. 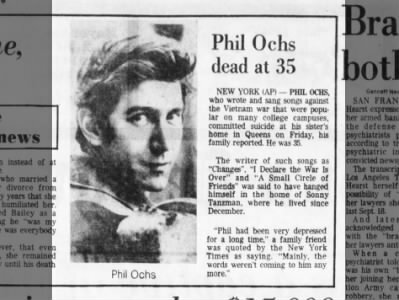 PHIL OCHS WAS, in the literal sense of the phrase, the Movement’s poet revolutionary. He came to prominence as the civil rights movement came to national attention, experienced his greatest popularity at the height of the antiwar movement, and when the protest had died down, there was no place for him to go. 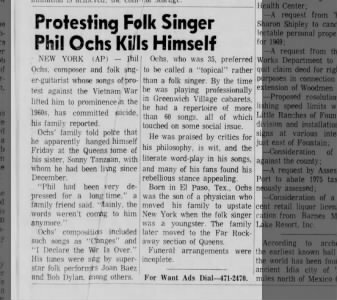 Unlike other protest singers who were able to maintain a sense of their own space in relation to their audience, Ochs was at one with his audience. His songs expressed a consensus of feeling on the issues of racism, war, and imperialism. 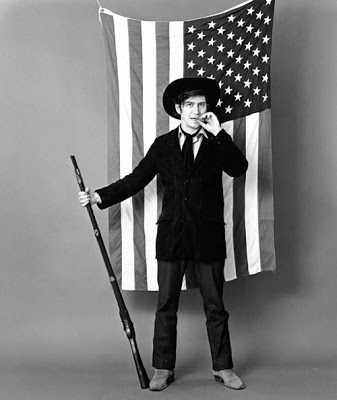 His style, honest and direct, was well-suited to the attitude of the politically conscious in the early 1960s. 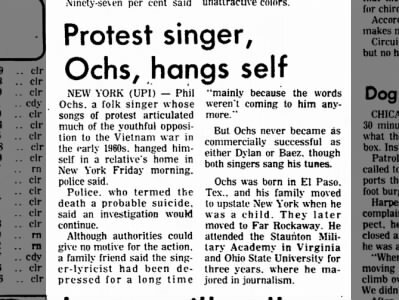 Ochs’s songs were best appreciated at large demonstrations. They didn’t lend themself easily to the privatistic world of posh living rooms and expensive stereo systems. 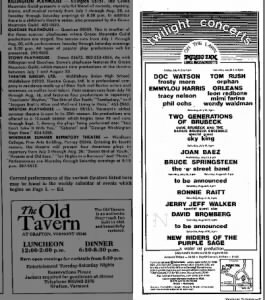 His music was meant to be experienced immediately, communally. At their best, his songs could move audiences to anger, love, and hope. 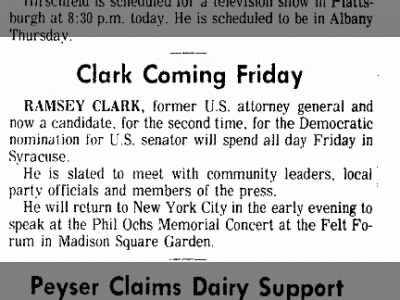 I go to Civil Rights rallies And I put down the old DAR (DAR, that’s the dykes of the American Revolution) I love Harry and Sidney and Sammy, Hope every colored boy becomes a star. But don’t talk about revolution, That’s going a little bit too far So love me, love me, love me, I’m a liberal. 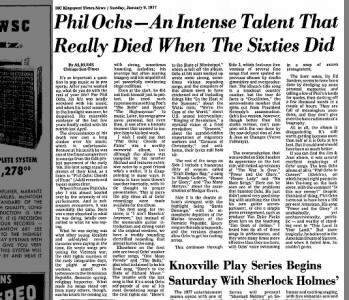 In those, the best years of the Movement, Ochs was at every important rally and demonstration. He gave of himself tirelessly. 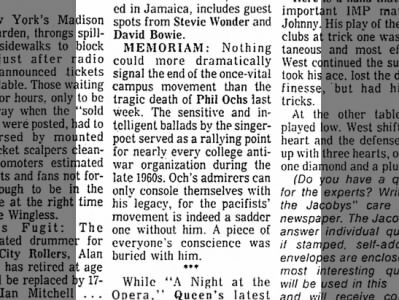 But something happened to the Movement along the way, and with it, to Ochs. 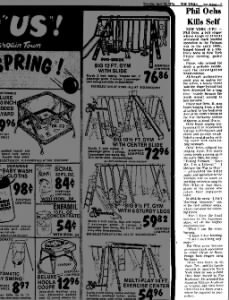 From protest, which had originally unified the cultural and the political, there evolved a self-indulgent counterculture that relied on drugs, sensations, and electricity. 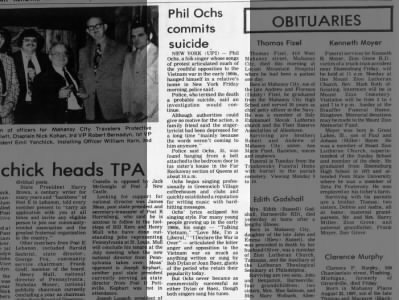 Ochs, unable to make the transition, was left behind. 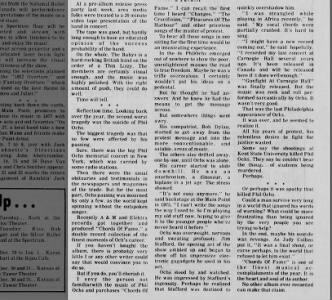 Perhaps the turning point was in Lincoln Park, Chicago, in the summer of 1968. The naked violence of the state, until then aimed against nameless peasants in Vietnamese villages, was now directed against the young demonstrators. 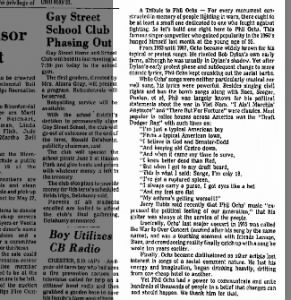 Afterwards the Movement took perverted forms, such as the SLA and the Weathermen, and many former activists went into seclusion. 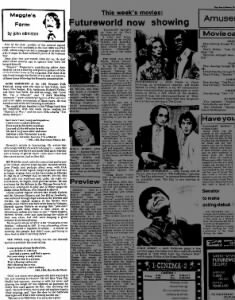 Ochs flirted with the various sects that emerged from the anti-war movement–he was in the streets of Chicago with yippies Jerry Rubin and Abbie Hoffman in 1968, nominating a pig for president–but he was too bright to believe that any of these fringe groups would achieve anything. 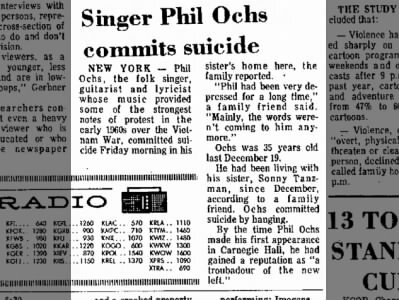 But now the real movement was dormant, and with it the source of Ochs’s creativity had dried up. He could only write with the momentum of the crowd behind him–he was sustained by their energy and hope. Richard Nixon, find yourself another country to be part of. He was overweight, drinking. 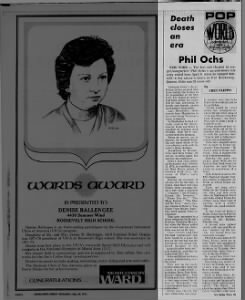 His message was the same as always–the struggle was worthwhile, eventually it would be won, but now, with no barricades to man, his heart was not in it. Oh, why sing his songs and forget about the aim, He wrote them for a reason, why not sing them for the same. And now he’s bound for a glory all his own, Now he’s bound for glory.